This story was reported in collaboration with Great Lakes Today, a public radio station consortium that reports on the Great Lakes, and NPR. Image at top: An aerial view of Chicago, on the shores of Lake Michigan. The cost of water for a family of four there has nearly tripled in the past 10 years. For months, the Rev. 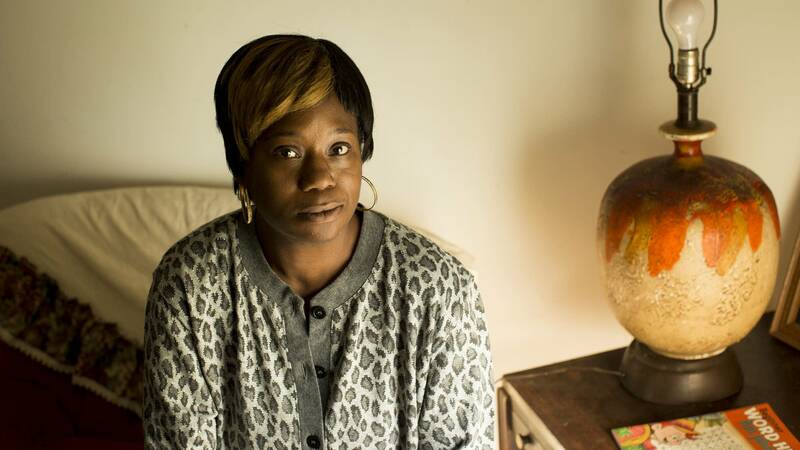 Falicia Campbell kept a secret from her congregation, her friends and even her adult children. It was a secret she was ashamed to divulge: She was living without running water. She couldn't pay off her water debt, and in August her water was turned off. The Chicago Water Department offered her a payment plan but required a $1,700 deposit before restoring her water. She didn't have it. Here she was, living a few miles from Lake Michigan, one of the largest sources of fresh water in the world, and she didn't have running water in her house. Without it, her daily life became a struggle. "I just said, 'Oh God, whatever I did, forgive me,'" Campbell said. "This was a lesson. I had my lights off before, my gas off. But water, I didn't realize how important water was until I didn't have it." The crisis is especially acute where you would least expect it — the Great Lakes, the region of the country with the most abundant fresh water. A nine-month investigation by APM Reports examined the cost of water in the six largest cities that sit directly on the Great Lakes — Chicago, Cleveland, Milwaukee, Detroit, Buffalo and Duluth — over the past 10 years and found that rates have risen alarmingly fast. In Chicago, the cost of water for the average family of four nearly tripled between 2007 and 2018. Cleveland's rates more than doubled — to $1,317 per year for an average family of four. And families in Detroit paid $1,151 annually. By contrast, that same average family living in Phoenix, which pipes in much of its water from 200 miles away and has been called the least sustainable city in the country, paid about two-thirds less. Many cities have been forced to raise rates to deal with decrepit infrastructure — leaking, cracking water pipes that, in some places, date to the 19th century. With the federal government allocating less money for water infrastructure, most cities have foisted the bill on to their customers, especially those who can least afford it. The APM Reports investigation found that the rising cost of water has hit poor families the hardest; the government-run water utilities in these six cities have issued at least 367,740 shutoff notices in the past decade. And an analysis of shutoff data revealed disproportionately high concentrations of water shutoffs in poorer areas and in majority black and Latino neighborhoods in every city. In Chicago, as in other Great Lakes cities, APM Reports found that water shutoffs were concentrated in poor communities and communities of color, according to an analysis of shutfoff notices from 2007 through 2018. 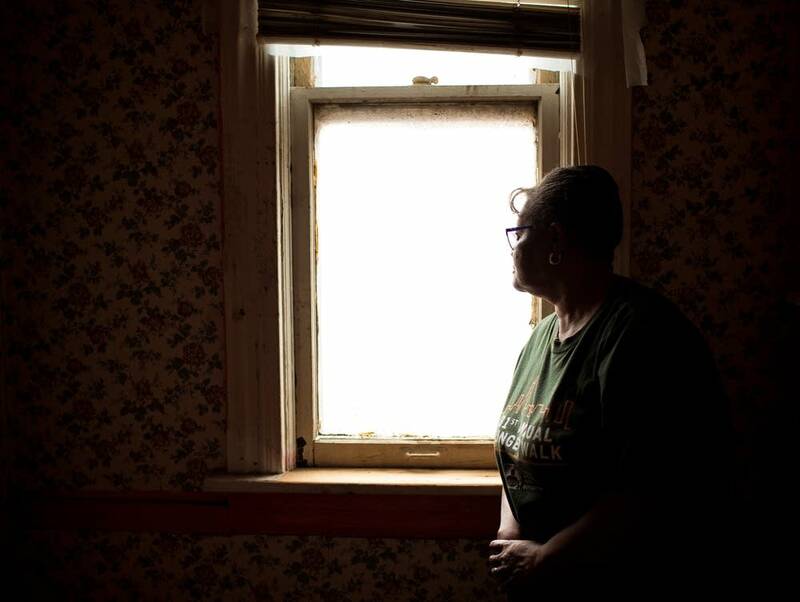 Residents can become trapped in a vicious cycle: losing water service and then enduring penalties, reconnection fees and extended payment plans or, in one city, even foreclosure. In Chicago, some poor families have resorted to stealing water, records show. Other struggling families take out loans from predatory lenders simply to access a resource they can't live without. Yet few elected officials on the local, state or federal levels have moved to address the growing crisis. City water departments offer payment plans and some financial assistance, but advocates for more affordable water say those are mainly Band-Aid solutions. A handful of cities nationwide have begun pricing water based more on what residents can afford to pay rather than what the city needs to repair or replace its pipes. The norm, however, is a pattern of dismissiveness and impunity as most cities continue to charge ever higher rates. Unlike more visible infrastructure problems — such as electrical blackouts, dangerous bridges or clogged highways — the spikes in water prices may go unnoticed by wealthier Americans. For months, Campbell's basic tasks like doing the dishes or getting ready to leave the house became expensive and arduous. To bathe each morning she had to pour gallons of bottled water into a pot to heat on a stove. She then carried the water up the steep stairs to the second floor and dumped it into the bath tub. She made the trip multiple times until she had enough water to take a bath. Then she'd use the water for the toilet. By the time she was on her way to her church, she was already exhausted. And there was a financial burden too: She was having to spend $20 a week on bottled water. "There's an old saying, you never miss your water until the well runs dry. And I found that out. It's very difficult to get around without water," Campbell said one day last October. By then, her water was back on. With the help of friends and family, it had taken her a month to come up with the deposit demanded by the Chicago Water Department. She's enrolled in a $120.93 monthly plan. If she's lucky, she'll pay off her debt by September 2021. Parts of America's crumbling water infrastructure were built more than a century ago. Even the newer pipes — the ones installed in the 1960s and 1970s — are nearing the end of their lifespan. Dealing with these aging pipes, including repairing or replacing them or losing untold gallons to leaks, is costing water utilities an increasing amount of money. In Cleveland, for example, the water department is spending $25 million a year replacing its aging pipes and passing the costs on to consumers. Nationwide, policy experts estimate that updating the deteriorating system will cost at least $1 trillion over the next 25 years. That means that while the federal government devoted billions to tax cuts, health care and wars, it decreased the money spent on water pipes from $76 per person in 1977 to $11 per person in 2014, according to a report by the Value of Water Campaign, which is made up of dozens of organizations, including city utilities and advocacy groups. While funding for water infrastructure decreased, federal spending in other areas, such as transportation infrastructure, which includes highways, aviation and mass transit, remained the same. "The federal government spends approximately 24 times more upgrading and maintaining the information technology infrastructure of federal agencies than it does repairing the nation's water systems," the report said. The decline in federal spending has created a big problem for local water departments that have to repair and maintain water mains and pipes, comply with standards set by the Clean Water Act and Safe Drinking Water Act and deal with more storm water that often interferes with the city's sewer services. The new reality for water departments is that their revenue has decreased while the cost of providing water to customers has increased because of the aging infrastructure, says Jeff Hughes, professor at University of North Carolina Environmental Finance Center. Hughes explained that regions with the highest rate hikes have experienced demographic shifts, including population decrease in some cities or growth in others, and have sizable infrastructure needs. For example, Atlanta has seen a big increase in its population and water rate hikes. Detroit, on the other hand, has experienced water rate increases for the opposite reason. The city has seen a major population loss: About 500,000 residents are subsidizing infrastructure built to support more than a million people. City water officials often contend that shrinking revenue and rising costs put them in a difficult position. Carolyn Berndt, program director for sustainability for the National League of Cities, which advocates for municipal services like water departments in Washington, D.C., said other factors that impact rate hikes include climate change — because of flooding and drought — and mandates from the federal government that require cities to maintain a certain level of water quality even as the federal government reduces funding for water infrastructure. "Cities are facing unfunded mandates," she said. Congress tried to address the lack of infrastructure funding in October, passing America's Water Infrastructure Act, which authorized more than $6 billion in spending, mostly for building and repairing dams and levees and increasing resources to rural communities and Native American reservations. The bill includes $250 million for states to supply to cities — in the form of low-interest loans — to upgrade or replace aging water pipes. But most experts say that amount is not nearly enough to address the nation's estimated trillion-dollar water infrastructure needs. There are thousands of public and private water utilities across the country. And experts say it's incredibly difficult to collect water rates from each one and compare prices. (Read more about how APM Reports compared water rates.) But many said they weren't surprised to hear that the cost of water was much higher in the Great Lakes region than in Phoenix. Phoenix gets its water from the Colorado River, about 200 miles away. It's piped to the city through the Central Arizona Project, built by the U.S. Bureau of Reclamation between 1973 and 1994. The project was, for the most part, federally funded, but there's a repayment plan in place. Advocates contend that water departments could be doing more to alleviate the pain that high rates inflict on poor residents. While private utilities often must get their rate increases approved by a government watchdog, city water departments — government agencies — are largely free to determine how much they must charge for water. In some cases what struggling residents hear from the water department is a cold, simple message: Pay up or lose water service. "Water is the No. 1 thing that people, all of us, cannot live without," said Virginia Miller, operations manager of the Midwest Workers Association, which advocates for low-wage workers on Chicago's West Side. "For our city to be shutting off water from families is unacceptable, and it's something that's unacceptable really in the eyes of the world." On a warm August afternoon, Cecily McClellan stood in a room filled with donated bottled water inside St. Peter's Episcopal Church in Detroit. She was getting ready to start her biweekly water deliveries. 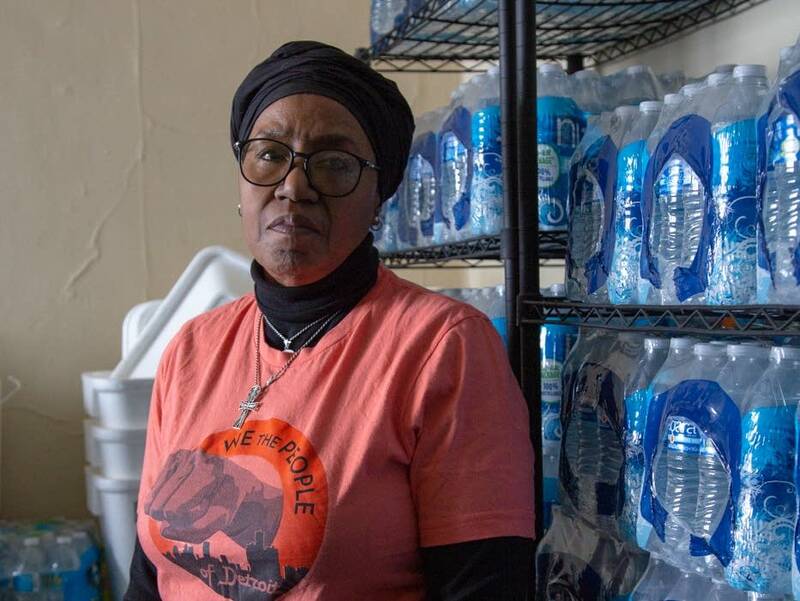 McClellan is a founding member of We the People of Detroit, a grassroots organization that advocates for affordable water and hands out free water, trying to help those in need. Before she retired and became an activist, she managed the city's water assistance program. Wearing an Aretha Franklin T-shirt, she climbed into her orange Chevrolet to make her water rounds. She arrived at the house of Reginald Newberry, a then-61-year-old man who's been living without water for two months. He was sitting on his porch when she pulled up. He's been in this house since he was a baby. Today he's facing $1,336.93 in delinquent water bills, a total that's grown over the years. As McClellan stacked five cases of water on his porch, Newberry described the absurd scenario he faces. He suffers from chronic obstructive pulmonary disease, and as McClellan pointed out, he'd recently been in the hospital with pneumonia. Though his water had been shut off for months, he's still getting bills — the city's charging him for sewer — and his balance is growing. But he's not getting help from the "assistance" fund; instead he's being charged for it. Newberry said he might need a lawyer to get his water restored. McClellan promised to help if she could. At the very least, she'll be back in two weeks with more bottled water. "I'm glad the city has a program providing water to needy people," Newberry said as McClellan was leaving. "It's not the city," she quickly responded. "It's a nonprofit. We the People." Back in her car on the way to another delivery, McClellan talked about the city's water crisis. Many of the people McClellan delivers water to have had their service shut off due to nonpayment. In fact, between 2010 and 2018, the Detroit Water Department issued 142,953 water shutoff notices. The cost of water in Detroit has doubled over the past eight years. The average cost of water and sewer fees for a family of four is $1,151 every year, according to the APM Reports analysis. It's gotten so bad that We the People has set up a water hotline that residents can call to request bottled water deliveries and seek free legal advice about dealing with the city. "We try to keep them informed so that when they call the water department, they're armed with the correct information," McClellan said. The fight over water equity has been going on longer and been a far more public controversy in Detroit than in other Great Lakes cities. In 2014 the city's water department, which had been accruing massive debt for years in part by not collecting unpaid bills, decided to get tough. NPR reported at the time that residents owed about $90 million in unpaid bills, according to the city, and the department aggressively tried to collect, resulting in a round of water shutoffs. Hundreds of Detroit residents protested the shutoffs. We the People called for an end to them. By June 2014, the United Nations labeled Detroit's water crisis a human rights violation. "It is contrary to human rights to disconnect water from people who simply do not have the means to pay their bills," said Catarina de Albuquerque, a U.N. water expert, following a three-day visit to Detroit. In 2014 the city sent 28,529 shutoff notices, and the community was enraged. Unlike in other cities, Detroit has seen far more grassroots activism on the water crisis. "[We the People] let customers know that they do have rights, that the water system is owned by the residents of the city of Detroit, and that water is a human right and that water should be affordable," McClellan said. In Detroit, as in other Great Lakes cities, APM Reports found that water shutoffs were concentrated in poor communities and communities of color, according to an analysis of shutfoff notices from 2007 through 2018. That same year, the rising cost of water in Detroit led officials in Flint, Michigan, which had been receiving water from Detroit, to find a new source. That fateful decision led to the now infamous lead poisoning in the city's water supply that became a national scandal in 2016. Despite having poisoned water, according a 2016 study by Food and Water watch, Flint residents paid the highest water rates in the country. Valerio moved to Chicago from Mexico more than 15 years ago. She met the father of her two children, and they bought a house. When he moved out, she kept the property. She pays the mortgage, property taxes and other bills. It's a small bungalow in the heart of Chicago's Little Village neighborhood, a poor, largely immigrant community. Though she lived only about 7 miles from Lake Michigan, she'd never been to the lakefront. Valerio and her children spend most of their time in their neighborhood. Chicago is a highly segregated city where residents adhere to invisible lines defined by race and class. APM Reports found that the cost of water for customers like Valerio tripled in Chicago over the past decade, from $178 per year to $576 for a family of four. But for Chicagoans, the cost of water is only part of the bill. They also pay sewage fees, which are a flat percentage of the total water bill, and a garbage fee. Sewer fees in Chicago have also increased during the past decade: In 2007, they were 83 percent of the water bill and by 2015 those fees increased to 100 percent. In 2018, Valerio started noticing her bill increasing every two months. She was working six days per week for 12 hours a day at a temp agency, and when the bills escalated to more than $700, she couldn't afford to pay. The water department said it would send an employee to check for leaks that could explain the increase. High water bills are often the result of leaking pipes. But she was disappointed when the employee refused to check for leaks inside her house. At that point, she decided to get on the payment plan offered by the city. 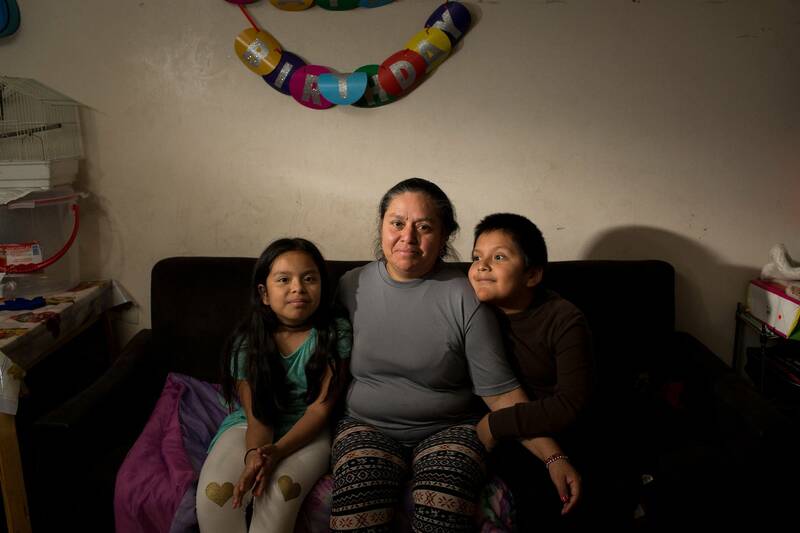 As a single mother with no family in Chicago to lend her money, and without savings or good credit, she had to apply for a $600 loan from Oportun, a financial services company that offers high-interest, short-term loans for borrowers with bad or no credit. She used that money to pay her bills, including water. The rate increases have affected the working poor like Valerio disproportionately. Over the past decade, the Chicago Water Department sent more than 150,000 water shutoff notices. At the same time, the department restored service to just 59,000, according to agency records. Since the water department didn't provide a unique identifier for each water account, APM Reports can't identify any repeat shutoffs or reconnections to a single customer. Tellingly, illegal restoration of water, which carries a $500 penalty, outpaced legal restorations of water in more than half the years reviewed, APM reports found. Nearly 40 percent of the shutoffs were concentrated in just five of the city's poorest ZIP codes, on Chicago's South and West sides. One ZIP code, which encompasses parts of Roseland, Pullman and West Pullman, had the highest number of shutoffs — 17,500 — in the past decade. Roseland is one of the poorest neighborhoods in Chicago. Once the water is shut off, it can be expensive to reconnect it. There's a $40 fee to reinstall services after a nonpayment shutoff, and residents are charged a 1.25 percent penalty of the total amount owed. Since 2007, the water department charged residents more than $6.9 million in fines and fees. These penalties are also concentrated in Chicago's poorest neighborhoods. More than $2 million — or 29 percent — of penalties were issued in the 10 poorest ZIP codes, according to the APM Reports analysis. To understand how deeply these additional fees can trap families, take LaTunda Cobbins' bill as an example. Cobbins owes $18,792. She doesn't understand how it got so high. Over the summer, the water was disconnected for more than a month. Cobbins lives in Englewood, a mostly black neighborhood in Chicago's Southwest side. Her neighborhood had the second highest number of shutoffs in the city over the past decade. In 2002, the Cobbins' home caught fire. Police called the fire arson. Cobbins moved in with family members and later rented an apartment. But the reconstruction of their home took more than 10 years, mostly because the rebuilding was expensive. Once the family moved back in to their rebuilt house, they received a water bill for more than $18,000, and later she got a shutoff notice. Cobbins said she didn't understand how that was possible since she called after the fire to turn off the water service. How could a house where no one lived accrue an $18,000 bill? The city would give her no answers. It simply demanded payment to continue water service. "When I first found out how much I owed, I immediately called them to let them know we never received the water bills," she said. "They gave us the option to pay the full amount or get on a payment plan. They told us it wasn't their concern, they just needed to see how we were going to pay the bill." While she was desperately trying to pay off the outstanding bill so that her water wouldn't be disconnected again, she was charged an additional $569.60 in penalties on her last bill. Cobbins and other residents living in her ZIP code paid $258,680 in penalties and fees over the past 10 years. Unlike in Detroit, there's no activist group staffing a hotline that she could call for legal advice. 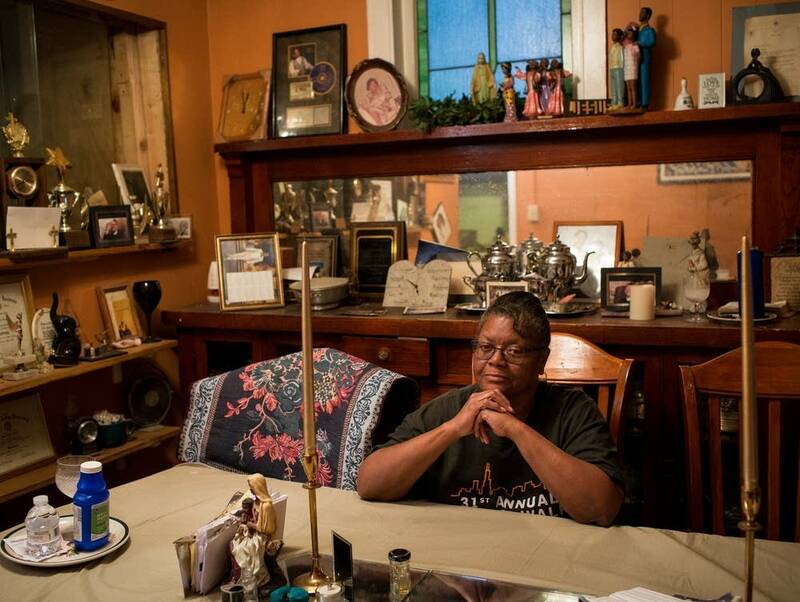 Cobbins' eternally hopeful attitude keeps her family afloat. She manages the family's finances, and despite owing so much, she strongly believes she'll manage to pay it off. She lives with her retired parents, both veterans, and two teenagers she's raising. "I can tell you this is stressful," she said. "We've been holding here. We've been doing the best we could, day by day, little by little." Unlike with electricity and heat, many water utilities don't have discount programs for working families struggling to pay the bill and none had a system for dealing with residents suffering from serious chronic illness, such as cancer, who were also facing a water shutoff. It was a long hunt for cities' water data and the tricky matter of comparing apples to apples. Read more. Virginia Miller with the Midwest Workers Association said her organization helped a 75-year-old veteran battling cancer who was also facing a water shutoff. The man worked as an Uber driver to pay his bills but had to stop for his chemotherapy. Miller said that the man had been struggling with his water bill for years. When Miller met him, he owed more than $16,000 and about a third of that amount came from penalties. 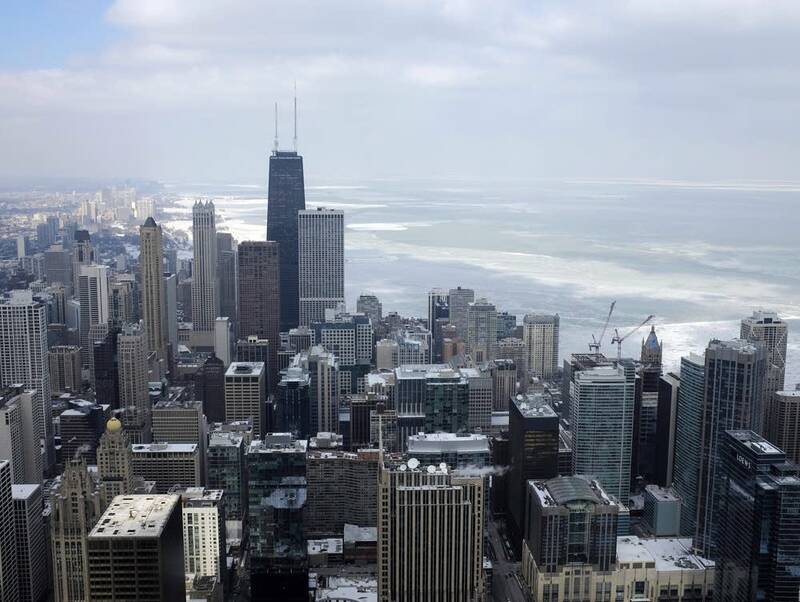 Margaret Schneemann, water resource economist with the Illinois-Indiana Sea Grant program and the Chicago Metropolitan Agency for Planning, said water departments rarely talk about affordability. They're instead focused on providing safe and quality drinking water that complies with the Clean Water Act standards. "There really isn't another way to pay for these improvements," he said. "I think [water in Cleveland] is affordable for the vast majority of our ratepayers. Even though we have raised rates higher — we're probably on the high end as far as utilities across the country — I think we're at the appropriate level given the challenges we have with the age of our system and the mandates we have to protect the environment and Lake Erie." Manuel Teodoro, associate professor at Texas A&M University, says one potential solution is for city water departments to change their pricing structure. He is advocating that utilities switch to a new formula he's researched that better reflects how much families can afford to pay for water: Basing rates on the hours people work, using an hourly minimum wage. "People are looking at the wrong metrics," he said. "They're coming up with the wrong answers, and they're not measuring something that reflects the lived experience of a household struggling to make ends meet." Teodoro, whose research was used by officials in Phoenix to restructure water rates, said water affordability should be a vital mission for every utility. "If customers can't afford the service then the basic mission of the organization is failing." he said. "I fear that in a lot of cases for low-income households, they're paying either with the economic opportunities that they're missing or they're paying with their health, because they can't afford the basic levels of service that they need." A more progressive pricing structure could have helped Falicia Campbell, the Chicago reverend. When she got the shutoff notice, she was in the process of applying for disability following the partial loss of her eyesight. She called the water department and explained her limited means. Because she had a documented disability, the water department reduced the deposit required to start a payment plan. But that still came to $1,771, which she couldn't afford. Campbell used several hundred she had in savings, but she was missing most of the money she needed. She felt too ashamed to ask friends and family to lend her so much, but eventually she reached out for help. Now that her water is reconnected, Campbell says she feels like a new person. "I was able to go back to my regular routine," she said. "I could live again." Correction: Feb. 13, 2019 An earlier version of this story reported that the fee to reinstall services after a nonpayment shutoff in Chicago is $45. It is $40. Additional reporting for this story by Elizabeth Miller with WCPN in Cleveland, and by David Montgomery of APM Reports. Support for this project came from The Water Main, an initiative from American Public Media focused on building public will for clean, affordable, accessible water. Aerial imagery of Chicago courtesy of Google Earth Studio and Kiichiro Sato | AP.